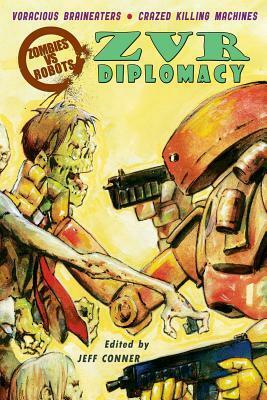 This book, ZVR (which stands for Zombies VS. Robots): Diplomacy is a collection of zombie/robot stories based on a comic book/graphic novel series under the ZVR title. I’ll be honest … when I requested this, seeing the publisher/distributor of IDW, I thought that this would be a graphic novel rather than a collection of short stories with one art page per story. The art by Mike Dubisch is quite nice and along with the layout of the book (text pages that have a graduating color to the page) gives the book a graphic novel feel. I’m not quite sure I understand the title. “ZVR” is clear enough (Zombies Versus Robots). But ‘Diplomacy’? I can conceive of a ‘diplomacy’ with an A/I series of robots, but zombies? By their very definition they are a mindless horde with only one goal – to feed. How can there be diplomacy there? And diplomacy for what? I’m not sure I get it, and I don’t think most of the authors did either because the stories aren’t about a negotiation/diplomacy/treatise but simply stories in which zombies and/or robots play a role. The problem inherent with zombie fiction is that it isn’t about zombies as much as it is about non-zombies surviving in a world of zombies. The stories are set around the world (hence ‘diplomacy’?) but as far as I could tell the location didn’t really make much difference to the stories other than as a different or interesting backdrop. My favorite story in this collection was easily “Exclusion Zone” by Dale Bailey, in which a father looks to protect his family from the zombie horde and finds the best way to do so is to put human brains inside of robots. It was the best, most creative combination of both zombies and robots in the book. Most of the rest of the book is pretty average fare. Nothing else really ‘wow’ed me or kept my attention as thoroughly as “Exclusion Zone” though at the same time, nothing was a complete bomb. Apparently this is a series (maybe graphic novel as well) but not one in which I am very familiar, so if there’s a connection to a larger world or story, I don’t know it. For me this was just a means to pass some reading time. I wouldn’t recommend it, but I wouldn’t steer anyone away from it either. Looking for a good book? ZVR Diplomacy is a collection of Zombie/Robot apocalypse stories around the world, collected and edited by Jeff Conner. It is very average reading but fans of the milieu will likely enjoy it.